In today’s highly digitalized world, Social Media has become the most powerful source of marketing. It’s a very effective tool to increase brand awareness, generate leads and boost conversion rate. But not all social media marketing techniques work. In order for you to harness its power, there are social media mistakes that you must avoid. Social media marketing is fundamental for businesses these days. It has fantastic channels where you can build a genuine relationship with your audience. It’s surely going to add more spice and excitement to your daily marketing activities. However, it’s crucial that you find the right social media strategy for your type of business. It’s a big factor that will affect your professional social media presence which gives you the strong brand authority. 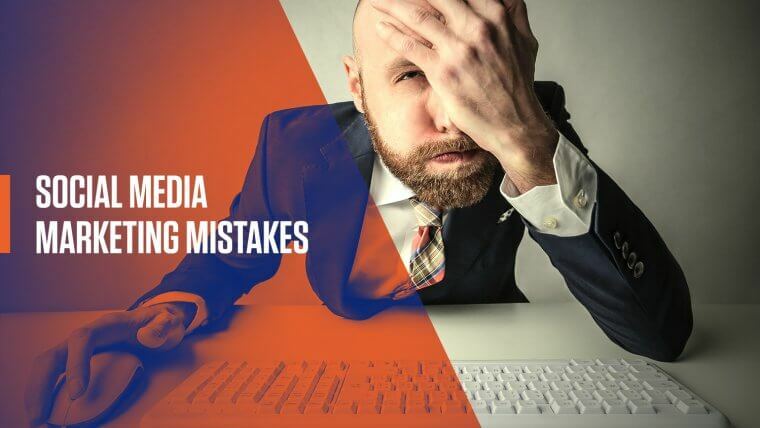 Here are the most common social media marketing mistakes that you must avoid. FYI, social media can make or break your business. This list includes things you must NEVER IGNORE! When contemplating the use of social media marketing in support of your business, you need to set clear goals. Seeing the horizon means understanding the obstacles. What do you want to achieve? How will you achieve it? Social media marketing is a multi-faceted approach. Beginners and non-experts might get confused and efforts could go to waste. But by identifying your goals, you have a clearer vision of your target and know exactly where you are heading with your social media marketing roadmap. With the social media landscape moving so quickly, your goals will help you stay focused. Social media is an open platform that gives people the freedom to communicate and express openly. It’s the reason why some marketers think that everything you do on social media is going to work. And a plan is not really necessary. They couldn’t be more wrong! Social media marketing is also a process that one has to carefully execute. It has a step-by-step blueprint that guides internet marketers to track different goals for different social media channels. You need to be strategic. Build a social media marketing plan if you want to develop products and services in your business that will meet the needs of your target market. The plan will help you strategize social media tactics tailored to your brand. The best social media strategy is not set in stone. It is a constant work in progress. So before you start taking steps, create a good plan and make it realistic. Since social media is an open source for advertising and promotional campaigns, there are marketers who fail to reach their target audience. It’s a waste of time and money. And it is one of the worst social media marketing mistakes one can commit. Efforts become worthless because your message is not recognized by the right group of people to whom your product or services are intended. So where will sales come from? Of course, the answer is NOWHERE. Your target audience are the people you want to hear, see and interact with. Using social media marketing means reaching out to potential clients across different countries. Get your message to the right people. There are many different ways to approach your target audience. For example, use real-time comment features in social media. Ask questions to know the problems of your target audience that your product or service can solve. By providing a solution, you are making it easy for people who are looking for you to find you and spread the buzz because, well – you solve their pain, you give them relief, and YOU ARE VALUABLE. This is deadly on social media. If you market on social networking sites, be as interactive as you can. Once you start posting and sharing content, you will start receiving responses. These could be likes, comments, and shares. Remember that you don’t need a question to reply. A simple thank you on a ‘share’ will bring a positive impact not only to your post but to your business as well. Your presence and the way you appear e matter a lot. It will make your audience feel important. It will boost your reputation. Probably even so much so that consequently, you might start receiving hate and negative comments. You know – haters gonna hate. Never feel bad. You cannot please everybody. The best thing to do is to respond in a kind and respectful manner, and kill them with kindness or wit (if your brand allows that). On a more serious note, though, those bad feedbacks can be an indicator to know what you need to improve. Whatever the situation is, you can always make the best out of it. So be constructive and look on the positive, or practical side. Bad contents are your social media posts that work against you. These can be nonsense videos, crappy images or stock photos, and the worst sin of them all – outdated news and articles. These are all examples of social media posts that can generate bad impression in the social media community. Posting them means wasting your followers’ time. Avoid that if you don’t want to lose your tribe. People unfollow accounts that share and post worthless stuff, unless it is awesomely funny and hilarious. A good example of a compelling and attractive post is an explainer video. These are concept videos that tell the story of a business in a concise but very comprehensive way. Social media posts do not have to be lengthy to be reliable. As a matter of fact, it’s the exact opposite. As social media consumers we are all ADD. Your viewers including. Therefore, it’s crucial to catch their attention in the first couple of seconds. Post inspiring and informative contents. They are easy to love and are worth sharing. I can’t stress the importance of this one especially in light of all the fake news generated around us. There is a crisis of trust worldwide, and you should take it into account. Some people post ‘too good to be true’ contents just to attract viewers or readers. Some even give false hopes and promises. This is one of the worst social media marketing mistakes and you must avoid it. If you can’t say something that’s 100% verified – don’t say anything at all. Posting lies or false claims can hurt your business a lot. Even Google can penalize you if you do so. Do not plagiarize and do not copy. In the eyes of your social media audience, this will be considered untruthful. Create your own post and be honest. Some may ignore its importance but this is very helpful. If you share the contents of others, give credit. Being honest pays off. Being dishonest could ruin your positive image. While some might think that ‘you can be the bigger person’ or that ‘comparison robs you from satisfaction’, we could only agree with them when it comes to your personal life. When it comes to business, it’s actually very very wrong to overlook your competition. Social media marketing will expose you, not only to your target audience but also to your competitors. Don’t avoid them in return. Map your strong competitors and learn from them. This doesn’t mean to necessarily spy and copy-paste every move. What this means is to analyze and try harder than them – strive to be more, bigger, better. It’s stimulating, and as with food – appetite comes with the meal. When you see their strategy, study and think better. If you think that others brands outshine you and there’s no way that you can defeat them, go with the flow. You don’t always have to lead. Begin by making your own name in the niche where you belong. Also, there are social media marketing experts who can help you. Never be afraid to seek help. Their services and expertise can help you beat your competition when it comes to using social media marketing. One of the main reasons why social media is a very popular tool for marketing is because it’s free. Not spending any money on promoting a brand is very attractive to marketers. So most entrepreneurs take advantage of this social media benefit. But since social media is loaded with other advertisers, it may be difficult for your brand to stand out. Especially if you have established giant competitors. Another nuance here is that almost every major social media platform introduces new rules on organic reach – in many cases, the drops in organic traffic are staggering. It’s a trend and we can’t do much to reverse it. What’s the point of creating amazing content if nobody sees it, right? At the end of the day you would need to invest in some paid social media advertising. There are channels that don’t cost too much, so you could introduce it to your marketing strategy with relatively low risk. The best thing about paid social media advertising is it will certainly bring results. Compared to free social media ads, paid ones allow you to target with incredible detail. You also get a certain level of guarantee that your target audience will see your posts. Most importantly, you get more in-depth metrics than the majority of native or third-party reporting tools can generate for organic content. It is good to hear that many businesses all over the world are so greatly benefiting from the simple convenience and effectiveness that social media offers. A lot of marketers and entrepreneurs have now turned to social media as their weapon against the competition. Social media, in the first place, is where people can be found. Almost every business, regardless of size and industry, is already using social media to reach their desired audience. It’s simply because these social networking sites are tried, tested, and effective for real networking, growth, and engagement for any type of entrepreneurial venture. So whether you’re a large business or a one-man-army entrepreneur, social media marketing should be a part of your marketing arsenal. Get the benefits of social media marketing today! Social media posts and ads are crucial ways to drive traffic to your website. Generate leads. Social media offers an easy and low-commitment way for potential customers to express interest in your business and your products. Social media has changed the way we communicate. It’s in our best interest to be informed about all of the new possibilities to manage our online reputation. Social media is not just about brands connecting with their customers. Social media gives you an opportunity to talk, share content on topics that you know much about, follow people and interact with them. There is a lot of noise online. Social media allows you to hone in on what you really care about and what you really want to read. Social media can help you connect before, during and after networking events, a conference or a meeting. There are countless personal and professional benefits of using it. With a little love and care, we can start building and shaping our personal brands into a powerful opportunity.